The key to a happy and healthy cat includes annual exams and vaccinations to maintain good health. With our new Cold Laser we can offer the latest in Laser Therapy which is everything from post op treatment to help surgery sites heal faster, treatment of skin ailments, to relief of arthritis complications. Dental disease can affect your cat’s comfort and compromise vital organs. 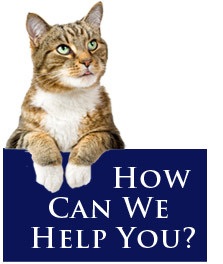 We provide professional dental cleaning to insure your cat’s excellent health. When your cat is ill, finding answers is primary. We provide surgical services for routine and emergency situations. Your cat will receive continuous care from our staff during their stay. Having your cat professionally bathed and groomed on a regular basis is important for healthy skin and fur. Regular grooming promotes healthy skin and is a good way to keep an eye on injuries, skin infections, tumors, fleas, ticks and other parasites. We recommend micro shipping your cat to ensure a quick return home, if lost. International Microchiping available for all overseas travel.